The 911 Carrera 4 is pretty much identical to the regular Carrera, except for the drivetrain. This 911 is All Wheel Drive! 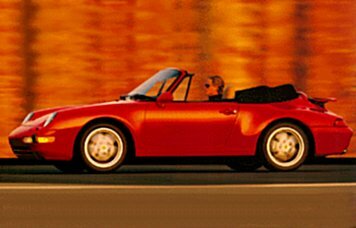 The Carrera 4 was originally introduced in 1989, and ran until 1994. 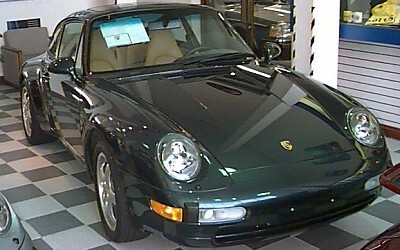 However, when the 993 came out, Porsche redesigned the 4wd system. The new system uses an all-new viscous coupling in silicon fluid. It is 110 lbs lighter than previously. The center differential measures engine temp, rpm, and power output before deciding how much slip there will be between the front and rear axles. A locking differential in the rear administers the torque split between the rear wheels. These 2 differentials send the engine's power to the wheel has the most grip. They are augmented further by the ABD (Automatic Brake Differential), which is an ABS driven traction device that helps reduce wheelspin further.